BOSTON, MA, UNITED STATES, August 1, 2018 /EINPresswire.com/ — Do you or a loved one have breast cancer? Are you aware of the importance of screening for breast cancer and how dense breasts may present challenges for you? You may be at high risk of breast cancer or reoccurrence and not know it. Join us for a free support program, Navigating Dense Breasts and the Breast Cancer Journey: A Free Patient and Caregiver Support Event, to see top Boston area breast care experts and get your questions answered. All are welcome. Caregivers and adult loved ones are also encouraged to attend to help in the breast cancer journey. Register for the free event now. Limited tickets available. Lori Fontaine, Vice President, Clinical Affairs, Hologic, Inc. Follow us on twitter and facebook as we announce additional program details and related news. This event has been made possible thanks to a generous grant from the Hologic Charitable Fund. 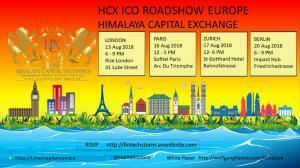 HCX & Symphony ICOs Roadshow. Don’t miss the free token drop! 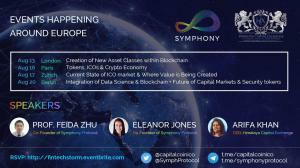 Symphony Protocol is a next-generation, blockchain based protocol to empower a data-driven economy. It is an infrastructure layer project, which will form the basis of an ecosystem of decentralized applications that focus on data intelligence, and creating an asset class for personal data. Symphony token sale is in the cornerstone & private sale stage. Currently, Symphony is backed by BMG Fund and others. 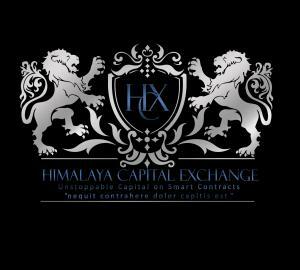 Himalaya Capital Exchange is a project aimed at creating a tokenised platform for Initial Public Offerings (IPOs) on a global, borderless, stock exchange. The Platform As a Service eco-system would offer an alternative to investment banks that are currently mandated to lead-manage IPOs, and give corporates, governments, and other entities raising public capital a less costly, and more democratic option with instant access to global investors. We are giving entrepreneurs everywhere the chance to create their own shares and bonds, and raise money within minutes from across the world frictionlessly. The platform would run on smart contract algorithms and at a later point make use of Machine Learning and AI in matching and creating a marketplace. This will be a first of its kind securities marketplace governed by token holders. Currently HCX is backed by John Puttick (Chairman of GBST), Arun Sharma (Vice Chancellor at Queensland University), Leanne Kemp (CEO of Everledger), Ghanshyam Dass (ex Director of NASDAQ & Board Member of KPMG), Mario Pazos (Pazos Law, USA) and others. Currently in private token sale before launching the public pre sale of tokens in Oct18. Arifa Khan, CEO, is a crypto pioneer who authored the first ever Concept Paper on decentralising capital markets (June 2017) before security tokens were invented. She later architected a platform ecosystem for capital markets participants in her revolutionary white paper published and presented to Nick Szabo on 25 May 2018. She founded HCX in 2017- a decentralized stock exchange that runs trustlessly on smart contracts – to bring that vision to reality and travelled the world for a full year to educate non crypto savvy people in remote corners on the benefits of self-issuing security tokens. HCX is the first-of-its-kind disruption which automates the role of investment banks, and empowers entrepreneurs around the world to issue their own security tokens. Arifa Khan is India Partner of the Ethereum Foundation and leads Ethereum’s community development efforts in India & Middle East. She has an MBA from Wharton School of Business, and a B.Tech from IIT Madras. She is a sought after international public speaker and has given keynote speeches at several global forums such as Crypto Investor Show London, Bengaluru Tech Summit, D10e Davos, Ethereum India Summit, Blockchain UA Kiev, Blockchain & ICO Summit Istanbul, Hybrid Block Macau Summit, Himalaya Crypto Summit 2018. She is listed among Top 100 fintech influencers by Lattice80. “Given the unprecedented growth of the Blockchain industry, Token Storm provides a ready marketing platform for ICOs, and for anyone to participate in the exciting crypto economy, earn free token airdrops, meet founders face to face, ask questions and learn about disruptions coming their way. We welcome ICOs to leverage our immense network and outreach and economies of scale in community building” said Arifa Khan, who is leading Token Storm Global Roadshow 2018. Previous ICO showcases have attracted thousands of participants and have featured the world’s most passionate crypto enthusiasts and prominent experts, and covered more than 10 countries in megapolis such as Singapore, Hong Kong, Seoul, Shanghai, London, Dubai, Istanbul, Kiev, Paris, Chennai. The Asia Tour Sep 2018 kicks off with Bangkok 29 Aug, visits Kualalumpur, Shenzhen, HongKong 5 Sep, Shanghai 12 Sep, Seoul 14 Sep, Tokyo 16 Sep, Hanoi, Ho Chi Minh City, Singapore 20 Sep, and ends in London 26 Sep. In each city, Token Storm will facilitate ICOs engaging with Blockchain and Crypto community, and potential investors. pioneering eco system builder since blockchain’s early days. Her network and access in the crypto economy is phenomenal and one can only aspire to experience the richness of insights and the connections Token Storm have with the crypto innovators across the globe” says Mario Pazos, Blockchain Angel Investor and an early backer of HCX ICO. Token Storm meetups at global financial hubs of the world represent a unique opportunity for tech enthusiasts, investors, developers and the local community to participate in Blockchain projects and witness first-hand the ICOs bringing a paradigm shift to various industries. 'S-HERTOGENBOSCH, NETHERLANDS, August 1, 2018 /EINPresswire.com/ — Today ENPICOM announced that they have finalized development and released the first version of their ImmunoGenomiX (IGX) platform to support the development, patient stratification and treatment monitoring of immunotherapies. The adaptive immune system, also known as the acquired immune system, is a subsystem of the overall immune system that is composed of T and B lymphocytes, which eliminate pathogens or prevent their growth. Moreover, the clinical relevance of T cells in the control of different human cancers and autoimmune diseases is beyond doubt. Immunotherapies that boost the ability of T cells to destroy cancer cells have proven therapeutic efficacy in a variety of human malignancies. 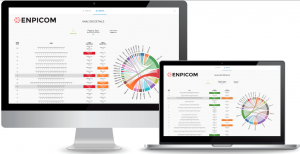 ENPICOM develops a T cell and B cell receptor (TCR/BCR) repertoire immunosequencing data analysis solution. This IGX platform will be modularly expanded to become a comprehensive end-to-end immunosequencing data analysis platform designed to analyze, monitor, and compare the immune repertoires in the context of immunotherapy development and at all stages of treatment and disease over time. Starting from high-throughput sequencing data, it will deliver an easy-to-read report depending on the specific application, be it research, diagnosis, patient stratification, or treatment monitoring. The IGX platform will allow customers to use their own sample preparation protocols and the next-generation sequencing technology of choice. It requires no programming skills as the interface is intuitive and flexible. 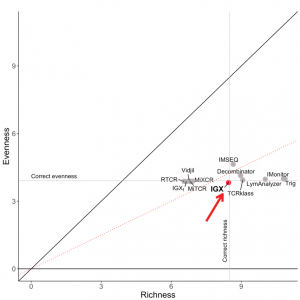 Using a recently published and independent benchmark, ENPICOM showed that IGX Explore offers superior accuracy. The independent benchmark was published in a recent paper by Afzal et al., in which the authors benchmarked ten state-of-the-art TCR repertoire analysis tools. More information about this benchmark study can be found at the company’s website.